Trish is the speaker of all truths, especially when it comes to knitting, even if she doesn't like knitting socks. Just in case you were wondering where you could go to find a speaker of truths. The other day I was whinging on about how for some reason - because I'm at the tail end again of a cold/flu thing that has me simultaneously sleepy and coughing all the time? because I'm not getting outside enough (see above)? because I am a failure as a human being? - I keep running out of groceries I forgot to replace, and am way behind on the laundry, and haven't even wanted to knit. yes, the moment I put those last few words together I thought, Do I need to see a doctor?? Mary. You are doing a full time job. You are WRITING. A. BOOK. Writers who knit live a highly risky double existence because each of these activities threatens the other. Not with sabres or anything, but still. It's hard physically to do both at the same time, and either one can fill your head so completely that there is no room whatsoever to ponder the other. Much like a closet full of stashed yarn you can never quite get through. ... current evidence aside, and haven't fallen hard for anything new yet. 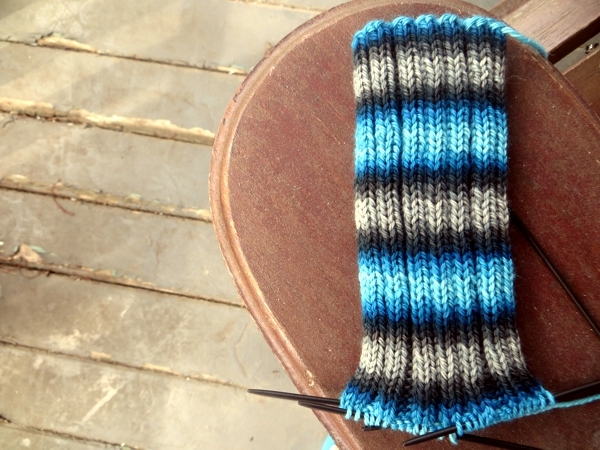 Either way I can barely dredge up the enthusiasm for more than about an hour of knitting a day. And how this is going to hit my numbers for May on the Knitting Planner, on top of the week or so I didn't knit or write while I was on holiday... well, let's just say it was lucky we are on the third day of a long weekend (thank you, Queen Victoria!) and that the weather was too cold on the first two days even to think of buying plants for a big landscaping effort. Free time today! sixty three hours of knitting! ... and, cue the balloons. The knitting planner has been a wonderful tool that I have ignored, more or less, these last few weeks. Or maybe I just memorized it, because the things I am knitting right now are all on it. So probably what I need to is make a new schedule to better balance writing and home maintenance, a combination that naturally produces gaps for knitting. Tomorrow there will be no tweet. Instead I am going to do short pieces here on Tuesdays and Thursdays and see how that pairs up with the book project. Yay! I'm at about 60,000 words on the book. Think good thoughts. 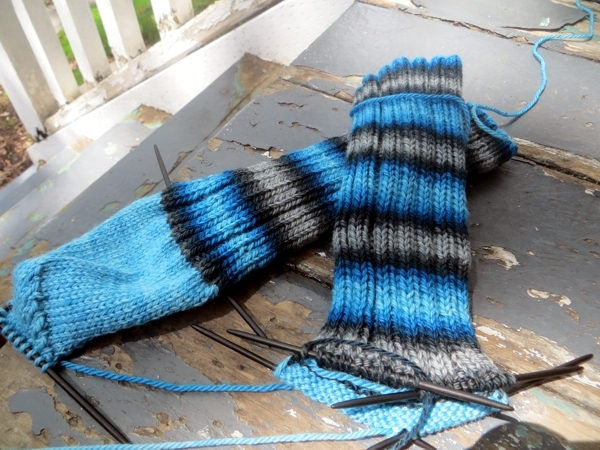 I just love these blue stripe socks. Good luck with the book! Lol! Pin those words above your computer! You are writing a book! Full time work!